I have been shying away from writing this race report, I keep thinking that I should sit down and get it all out, but there has been something stopping me. 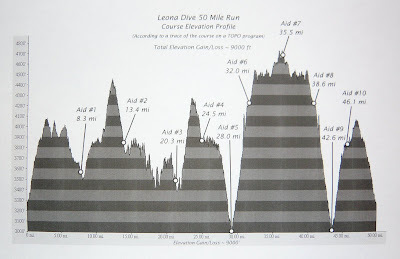 I feel like I don't want to write it down, because I am not ready to let go of some of the excitement and enjoyment that I experienced this weekend at Leona Divide 50 mile. I am not ready to (or perhaps haven't even started to) revel in the experience. I have been doing a great deal of thinking about my running and my direction therein recently and finally realized that I like to run. I know you are thinking, well duh!! But what I mean is, I like to run runnable courses, I like to see how fast I can run over long long distances. If you look at last year, all of my races were "my kind of races". Lots of flat, some cement, and the not flat was very runnable, wide dirt fireroads and single track. I recently realized that I want to focus on two main things for the next 4-5 years. First, I want to try and qualify for the 2012 Olympics in the marathon. Second, I would like to drop my 100k time down into the 7:40s. And meanwhile, I want to intermittently run some great trail races. With that decision in my head, I really look forward to the training I am going to get to do for that with help of my new (hopefully) coach, Howard Nippert. It is a pretty big step for me to take on a coach because I have been self-taught my whole marathon/ultra career but I know that my own knowledge and research can only take me so far. Sometimes the smartest thing to do is get an expert on the job. Howard, is definitely that. And he is my teammate on the 100k team and really understands where I am coming from. I ate my dinner and headed to bed early, and had a fitful night of sleep. My alarm went off at 3:30 and I got up ate my pb toast and banana and went back to bed for another hour. When the alarm finally went off, I got up dressed and grabbed my bags and headed out the door. The morning air was cool and I was very pleasantly surprised. It was probably mid 40s which is a great racing temp for me. I figured if I could get a couple of hours that weren't blazing, I might be able to hang on for longer. I made my way to the start in the dark, I have gotten so use to it being light before 6 being in the north that I was confused and for a moment thought, wait....should I have brought a headlamp?? I parked, got my number and race goodies (a nice blanket with Leona Divide emblem on it) and went back to hang out in my car and check my gear. I was enthused by what I could see of the terrain. It reminded me distinctly of the Headlands, the nice long wide hills, which go on forever in every direction but are very runnable. Finally I got out of the car, strapped on my "Krissy" Nathan pack, grabbed my water bottles (2) and walked down towards the bridge for the start. It was funny to see all the California people all bundled up in coats, hats and gloves. I was basking in the fortunate weather since it had been snowing in Seattle on Friday! I was wearing my favorite Craft shorts, my SRC jersey, my new pink Defeet arm warmers, headband, Rudy Project sunglasses and of course, my fabulous Inov-8s, the newest 295s which I love. I lined up in front, feeling a deep sense of calm and readiness inside. Krissy had told me to use her CR splits as an indicator of where I should be when and despite the 9,000 feet of climbing ahead of me, the potential for a repeat of the day before and some lingering calf pain, I wasn't worried at all. With a clang of a hammer on a saw blade, we were off. I headed out with the lead pack of guys but felt I was being incredibly moderate as we headed up and up and up a nice long fire road. I felt comfortable and in my element. Though we were running uphill for a really long time, I didn't feel like I was pushing myself too hard or straining. If anything, say for instance if this was a 50k, probably could have pushed the first 8 miles 15-20 secs faster. But I was enjoying myself and the field spread out pretty quickly. We wrapped around and around through the hills as the sun came up. It was beautiful and I simply got lost in the moment. I didn't have to think or worry or plan. I just ran and ran with a levity of spirit that had visited upon me once before at Tahoe, last year. Maybe its just something about the 50 mile trail races and me? I came through the first aid station at mile 8.3 at 1 hour flat. Ok, so I was moving but definitely still keeping myself reined in. I didn't even stop at the first aid station and headed across the road and up more very runnable hills. For this race, I had decided to carry my ipod shuffle with me for extra added boost along the way, but knew that I could only employ it at the right moment. I couldn't simply just put it on. So I waited. I came into the second aid station at 1:49 and grabbed my first Clif Shot Bloks and headed right back out. There were a couple of guys that I could see on the trail ahead of me and as I ran up the hill, I passed a few of them that I would not see again. I was still within the top 15 range and could see 2-3 more guys on the trail ahead of me as we snaked along, finally on single track. We got on the PCT and there was the sign that Krissy had told me about with the previous years winners on it! It gave me a boost to see Krissy's name up there! The weather was holding, still very mild temperatures with some clouds and lots of wind. It really reminded me more and more of the Headlands and I just floated along feeling pleased with myself and with my ability to run. I came into the mile 20.3 aid station, had them fill my waterbottles with water and I dropped a Nuun tablet in each. I was well under 3 hrs but had decided to ignore my splits and just run. From 20.3 you head up some steeper stuff, which was a bit slower but I was still (to my pleasant surprise) able to power up it easily. The wind was blowing pretty tough at this point and there were gusts so strong that I was worried I was going to be like one of the nannies in Mary Poppins and go blowing up the street backwards in the wind. I made it to the top and passed another 2 guys on the way, including one who in the first few miles had run past me working way too hard for that early in the race and was now suffering for it. The next time I would see him again, he would be nearly 4 miles behind me. After reaching the top, I got to enjoy a nice rolling downhill to the mile 24.5 aid station, where I once again breezed through and headed down more rollers to the mile 28 aid station. In my head, I had thought that the biggest hill had already passed. That said, I also knew at this point that any hill I was running down, I was running back up at some point since from 24.5 back to 42.6 is an out and back. I had been taking my calories, taking a gel or shot blok about every 45-50 mins. At 3 hrs I took my pills (caffeine, S caps and aspirin) and felt a lovely little boost. The chia was doing its magic and I felt good energy and hydration. I kept drinking to stay ahead but was feeling just right. As I was descending to 28, I passed a few more fellows and then had a guy run up on me, as I strongly descended the hill. "Krissy is that you?" I had to laugh, it is a compliment yes to be mistaken for such a great runner as Krissy, but at the same time, last time I checked Krissy hadn't hit a growth spurt and gained 6 inches in height. But it is somewhat understandable. I chatted with the guy for a bit, asked him if he wanted to pass, which he said no to and we made our way down to the mile 28 aid station. I topped up my bottles and off I went. I crossed another road and headed uphill, much steeper than before. But I was still running it. By now I had been running for over 4 hours, I can't remember precisely but I decided to pull out my splits card to see if I was anywhere near what I had anticipated. I saw that I had gone through the #5 aid station still ahead of pace, but as I glanced at my watch, thought there was no way I was going to be able to reach the next aid station by the split I had recorded. I had 4:36 written down for aid station #6 and it was 4:25 and I could still see the aid station (albeit way below after lots of switchbacks). I had a moment of where did all that time go? It was not possible that I had lost 10-12 mins off pace on a downhill. I was still moving up the hill sub 10s as well. I just shook my head, shrugged my shoulders and said, "do work, son", resigning myself to just focusing on the running instead of wasting time calculating splits. I was feeling a bit lower energy as I power hiked up the steep hill and consumed a gel and some more Nuun. The sun was shining now and I was happy to have my sunglasses, but also to have my sleeves since the wind continued to blow. The time had come, I needed to release the secret weapon. On Thursday, I had come upon one of my old running mixes on CD and had gotten really hyped listening to it. I had changed my shuffle mix to songs that I couldn't help but move too. As I hiked, spying the top of the hill and another bobbing head ahead of me, I put my headphones on and hit play. I nearly shrieked and laughed when the first song came on and was also the first song on the aforementioned CD. It is a great motivator and my pace suddenly quickened. I had it to the top. I would find out later that THAT was the hardest climb and that my split on my card was suppose to be a 50 something not a 30 something. I arrived at mile 32 aid station where it was a full on luau. Everyone was in grass skirts and coconut bras. "Here comes Devon" somebody yelled and I smiled and powered through the aid station, "there goes Devon", somebody said as I waved and smiled and said, "I'll be back soon!". Out to 35.5 was interesting terrain for that point in the race. It was really rolly, almost mountain biker appealing rolly and I was feeling a bit tired, but still good. I ate more gels and played cat and mouse with the guy in front of me. I kept taking my SCaps every hour and drinking my Nuun since I could feel myself getting nice and salty. The sun was brilliant but the temp was only about 60. I saw only 3 guys coming back from the aid station as I ran. I rounded a bend and could see the aid station through the trees. I caught up to the guy in front of me and he said, "man you destroyed that hill!". That was the nicest thing anyone could say because I have had waining confidence in my ability as an uphiller. We caught another guy who had stopped for a pee and all went into the aid station together. The guys at the aid station filled my bottles with water and again I dropped in my Nuun which I was carrying with me in my "Krissy" pack, aka a hydration pack without the hydration pack. Essentially it is like a singlet with pockets on the front for gels, nuun, ginger, etc. I headed back out, the timer telling me I was in 5th overall. Nice!!! And I was going to finally have the opportunity to see where the next woman back was. I now ran strong, enthused by the turn around and feeling like I was heading for home. 14.5 away from home, but home nonetheless. The front of the field was very sparse. I saw a few of the guys I had passed earlier coming along, but each one still fading away. At long last, I saw the next woman. She was about 1.5 miles behind me but not looking too bad. I decided to not give it any chances, especially since I knew there was one last hill back up from 42 before I would get more downhills. I enjoyed the current downhill alot though. I stopped at the Luau aid station and ate some Clif Shot Bloks and oranges, feeling a bit in need of energy. I took off, still jamming to the beats in my headphones. I greeted every person I passed who was coming up the trail and did my best to not collide with anyone on the corners. I hit the bottom of the hill, crossed the road and hooting and hollering ran into the mile 42 aid station. They filled my bottles one last time, dropped another Nuun and headed back up the hill that I had enjoyed so much on the way down. It was not nearly as steep as the hill going the other direction out of the 28/42 aid station, but I was more tired. It was a runnable grade but I could only intermittently run and power walk. I could see the top of the hill and knew that just beyond that was my final aid station and then beautiful, wide wonderful fireroad down to the finish. I pushed and pushed up the hill, calling on energy I didn't have. I had taken my second round of caffeine and aspirin which helped a bit but not much. I could see the guy who had lauded me for my uphill at the 35 aid station about 400 meters behind me and I pressed on. I finally came to the top and felt so relieved, even though I could see the aid station from a distance, I noticed there was a little rise up out of the aid station. Darn it! I came screeching in to the aid station, glanced at my watch 7:13 ish. And mentally tried to figure out if I was anywhere even remotely near Krissy's 7:42 Course Record. I couldn't do math and I stood there waiting for one of the aid station volunteers (bless them) to open a pack of Clif Shot Bloks for me. He couldn't get it open and I waited patiently, finally he got a knife and plopped them down in my hand. I should have just taken the pack and ran, but at that point in a race dexterity is not there to open those things. I ran out of the aid station at 7:15 and headed along the fireroad. I managed the little uphill and pressed my legs to give me a little more on the downhill. But I had to stop. And take a pee. I did a quick glance around and hoped no one would come down the road and did my business. About 4 water bottles fun of liquid later, I was off and running again. Triumphant beautiful songs played in my headphones and I got choked up. I looked at my distance on my Garmin GPS and it said I had about 2 miles to go. Really? Damn. Then I got choked up even more since I was ready to be done. I also wondering where I had lost that damn 20 minutes since I had been running strong consistent mid 9 splits for the race. Suddenly, I recognized the turn in the path and through the trees I could see the parking lot. Damn! I broke into a sprint and turned off my music, I wanted to hear the cheering as I came into the finish. I ran down off the path and around to the back of the main building and across the finish line. Pumping my fists and so happy. 5th place overall, 1st woman, 7:44! Had I known, had I known. Maybe I wouldn't have waited so long for the shot bloks, maybe I wouldn't have stopped for a pee. Maybe I wouldn't have tried to meter out my energy for the "last two miles". But really, forget maybe! I ran a near flawless race. I felt great nearly the whole way, mentally I was in a state of bliss, nutritionally I was within a good range (no bonks! ), and my hill running was great. I felt great! The RD handed me my finishers shirt, award and dirty girls gaiters which I had one in a raffle. I sat down on the stairs by the finish line and just beamed. The guy who complimented me came in a few minutes later and said, shaking my hand, "you really took off!" I was just so pleased with the experience, the whole journey I just wanted to stay in the moment as long as I could. I headed back to my car and back to the hotel, where my favorite post-run meal was stashed in my fridge: a Whole Foods burrito (yes with a whole wheat tortilla-which I am still paying for now, but is so worth it), kombucha and berries. I took my ice bath, packed my stuff and anticipated going home the next morning. I made it home safe on Sunday, even grabbing the last seat out of sheer luck on an earlier flight. My legs felt great and for the first time in a while didn't do alot of post race swelling. Once back in Seattle, I headed to Flying Apron for a cupcake. I hadn't had a cupcake in a really really (talking years) long time, especially finding out about my gluten intolerance. But I wanted one to celebrate and had been thinking about cupcakes since Alison and I went to Cupcake Royale the week before. I dove into the chocolate cupcake and it was perfect. Sweet, but not too sweet. Perfect texture and all while still being vegan, gluten free and alternatively sweetened. I spent the afternoon in my & my uncles organic vegetable garden turning over soil, mulching and generally "giving my legs a rest" haha. We went to thai food for dinner which is a close second to the post race burrito. It was a great weekend and I didn't want it to end. Or more, I didn't want to lose that feeling I had gotten during the race. I just was lovely, so very lovely.